Intersection | Prospect Heights returns this month with a panel discussion and series of tours to launch Our Places, a new booklet presenting stories and concerns of current and former neighbors, tracking development and demographic change, and looking at how it plays out on our streets. 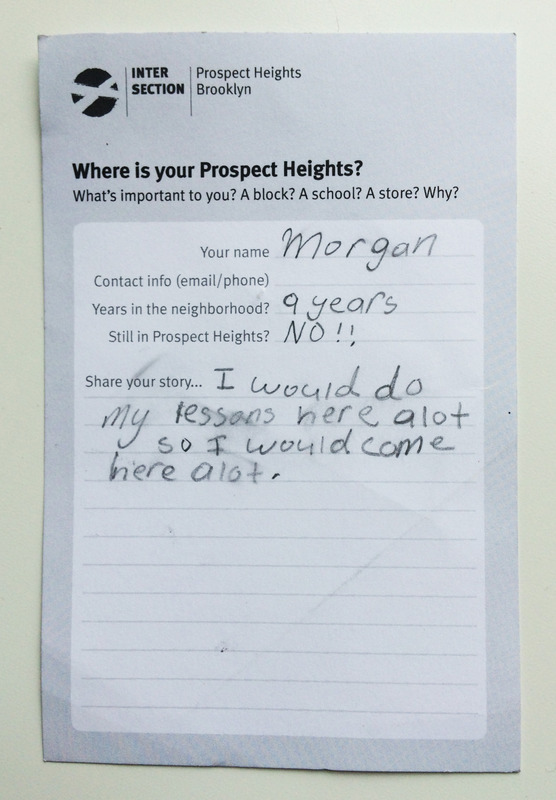 What is the future of Prospect Heights and our city? Talking with organizers, politicians and planners about the experience of change in Prospect Heights, and what it implies for neighborhoods across the city facing large-scale development. How do we preserve community? Speakers include Letitia James, NYC Public Advocate, Thomas Angotti (Hunter College, CUNY), Deb Howard (IMPACCT), Regina Cahill (North Flatbush BID) and Catherine Green (ARTs East New York). Moderated by Gabrielle Bendiner-Viani (Buscada) and Gib Veconi (PHNDC). Join us for creative walking tours telling the new and old Intersection stories in sites around the neighborhood. How these are similar or different to your own stories? I was both thrilled and stumped when Radhika Subramaniam and Margot Bouman asked me to contribute to “Masterpieces of Everyday New York: Objects as Story”, the exhibition now on view at Parsons Sheila Johnson Design Center. Why? Thrilled because I’m a New Yorker, born and bred, I live here now, teach students about cities, and generally have taken New York as a part of my being and birthright. Thrilled because I make photographic and urbanist projects that are all about objects and the emotional meanings vested in objects and buildings – like our Triangle Fire Open Archive and Open Museum, and my Guided Tours and SPURA projects. Thrilled because I loved the British Museum & BBC series, A History of the World in 100 Objects, which Radhika and Margot acknowledge as inspiration for this exhibition. But stumped too, because how could I possibly narrow down the number of objects in this city which have been meaningful to me – and the number I find to be important to tell the city’s own story as intertwined with my own? And of course, to be brutally honest, I wanted to pick something really good. But what? And how to make it something that only I could really write about? I mulled it over and over, and then, clear as day it came to me. A photograph I had written about before in drafts of my dissertation, diaries, and other places, as the way I imagine New York in my mind’s eye, though daily experience often contradicts it. This photograph of my mother and I standing at a phone booth on Kenmare Street in the early 1980s was taken by my father, and long ago, taken by me out of our family collection and carried with me on trips far and away as a way of remembering home. In this way, my nomination of the phone booth was a double object – both the photograph and the once-ubiquitous phone booths of New York themselves. You can read my full contribution below. The intertwining of 62 objects keenly felt by their nominators and observers can be seen at Parsons’ Sheila Johnson Design Center until September 4th, 2013. Read more about the exhibition on Design Observer and Paper Magazine, and several blogs. This is a double object. It is both the phone booth pictured (the kind you now see on city streets denuded of their telephones) and it is the photograph itself. This arrangement seems almost impossible to imagine now, when people give their children cell phones in elementary school. To suggest that a child might roam New York with but a quarter in her pocket as a way to call home (and with no way to call her!) would be unthinkable to many parents I now know. As I became a teenager, the phone booth was less the way I called home, and more the way I called friends: beeping my first boyfriend from phone booths (so self-important, and so terribly high-tech at the time), and learning the special code (now long forgotten) one could use to find the unlisted phone booth’s number, so someone could call you back. These ubiquitous booths weren’t beautiful, nor did they always work, but they provided a (sometimes false) sense of privacy in public for conversations, scribbling messages, drunkenness, exhaustion. New York’s public phone booths waned as my own participation with the public world grew. Now, as an adult, out in the world, and thinking about how my young son will one day call me, these private little spaces from which to reach out to others in the midst of a public street are now only husks, replaced by devices in our pockets, which people imagine envelop them in privacy, but mostly create intersecting bubbles of sound and chatter as we walk down the street.